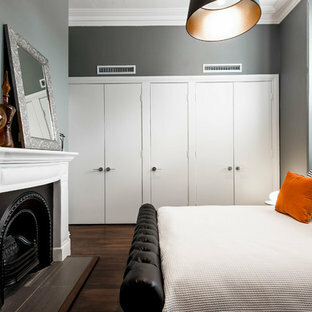 This is an example of a transitional bedroom in Perth with grey walls, dark hardwood floors and a standard fireplace. Design ideas for a large transitional master bedroom in London with grey walls and light hardwood floors. Inspiration for a contemporary bedroom in London. Inspiration for a modern bedroom in New York with white walls, dark hardwood floors and no fireplace. 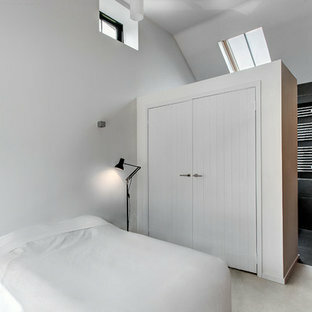 This is an example of a modern bedroom in Hampshire with white walls. Luxury, intimacy and drama are the inspiration for our Henley bedroom. Opulent, padded doors and headboards combined with the warm, contemporary Anthracite Larch finish and hammered honeycomb motif handles create a sophisticated ambience. 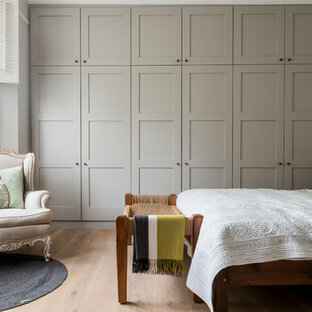 The bespoke fitted wardrobes are finished with sumptuous upholstered fabric panels. Along with these carefully stitched panels, we’ve created this exquisite contemporary headboard with integrated mirrors and bedside cabinets. 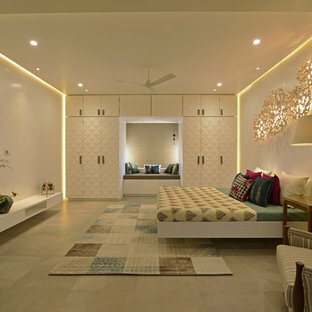 This is an example of a mid-sized contemporary bedroom in Mumbai. The key to creating a desirable bedroom which inspires a blissful night’s sleep was not just down to the bed and giant custom designed headboard, it came with all the added extras. The over bed storage, all in white was created to reflect our client’s taste and to suit her individual requirement for additional space. We incorporated spotlights and adjustable lamps within the storage space to provide her with greater flexibility. A druzy quartz knobs with gem-like shine were handpicked by our client for a natural finishing touch. Inspiration for a mid-sized contemporary guest bedroom in West Midlands with white walls, light hardwood floors and grey floor. Design ideas for a traditional bedroom in London with dark hardwood floors and no fireplace. John Lewis of Hungerford - Urban Living Urban flat-fronted door style painted in our Alasbaster piano gloss finish, with slim, curved bar handles in brushed steel. Beautiful geometric pendant light over a beautifully made up bed with lots of texture adds real glamour and sophistication to this master bedroom. Design ideas for a contemporary master bedroom in London with carpet. Inspiration for a traditional guest bedroom in Chicago with beige walls and carpet. Inspiration for a contemporary master bedroom in Sydney with white walls and dark hardwood floors. Photo of a contemporary bedroom in Toronto with black walls. Design ideas for a mid-sized contemporary guest bedroom in Pune with white walls and light hardwood floors. Transitional bedroom in London with beige walls, carpet and beige floor.